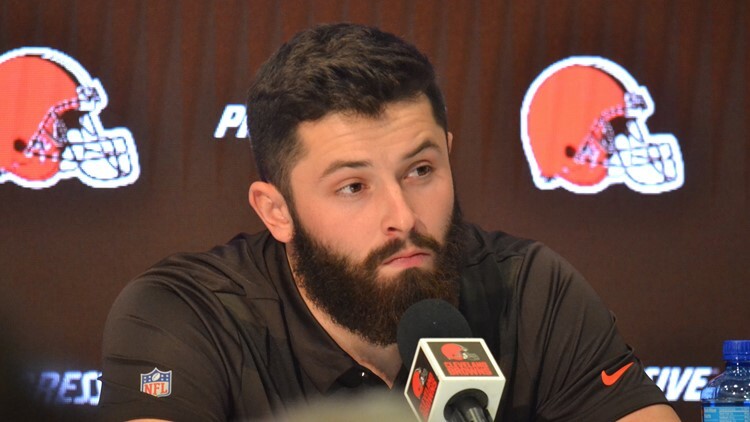 CLEVELAND — The legendary social media wars between Browns quarterback Baker Mayfield and Fox Sports host Colin Cowherd has been rekindled. On Friday's edition of 'The Herd," Cowherd stated that he's not buying all of the hype that has been placed on the Browns this offseason following the acquisition of wide receiver Odell Beckham Jr. In fact, Cowherd is convinced that OBJ is upset about being in Cleveland. "I have this as well-sourced as I can have it on Odell Beckham: He didn't want to go to Cleveland, he wanted to go to L.A! He's not happy," Cowherd stated. "Nobody will be honest about this Cleveland thing. It has a chance to be a complete and utter dumpster fire. Odell didn't want to go here, the owner is a control freak, John Dorsey is a control freak, Freddie Kitchens could be over his head, and I'm not even mentioning Baker (Mayfield), who's just a kid, a baby," Cowherd added. "Come to Cleveland and ask O if he actually likes it," Mayfield wrote. "Just because you say you have a source doesn't mean you're not full of BS." My favorite part is the dynamite drop-in at the end: "And while you're at it...come see if I'm a baby #10ToesDown."